When we first started using the Rites of Initiation of Adults we were worried about this sort of mix, and how to meet each person’s needs. Now we have stopped worrying! We see it as real ‘treasure’ for the parish. Using the liturgical year, and the lectionary, as mainstays for our catechesis, we have found that over a period of between 1 and 3 years our catechumens come to a deep understanding and experience of the mysteries at the heart of our faith. We are no longer ‘driven’ by the time constraints of a more programmatic approach – and we would call this more of an ‘apprenticeship’ into the Catholic Christian way of life – the sort envisaged in the Rite itself. All these people have knocked at our door at odd intervals since last January, and we have trained ourselves (!) to say ‘Come in’ rather than ‘Come back in September’. We are muddling our way towards an all-year round ‘Come and See’ enquiry. By about Advent most people have been with us for several months, and we offer the first opportunity for the Rite of Welcome (or Acceptance). In looking at the Rite together, seeing what is required, it has been discerned (by us and them) that 3 of our 7 enquirers are ready for this step. And that hasn’t been difficult – people know when they are reay, and we can see the change in them over the months – there is an infectious enthusiasm, an openness to the Gospel, eagerness to learn to pray, to be part of community life. Others are still a little cautious about what this commitment might mean, and want to carry on asking questions. With the limited resources in our small rural community, the team decided to have the enquiry and catechumenal sessions on the same night. This means a welcoming drink and chat, followed by prayer time and gospel sharing together, and then split into the two groups for the deepening catechesis, with two members of the team guiding the process in each group, with sponsors there to support. The main ‘pillar’ of our catechesis in Advent for both groups continues to be the Sunday gathering, with opportunity to reflect afterwards on the experience of the Liturgy – the heady mix of signs and symbols, gestures and vestures, words and silence, is rich enough fayre for any apprentice to feast on! Leading up to Christmas we have some parish activities planned, and the enquirers and catechumens are actively encouraged to take part in community life – special advent liturgies, an outreach to the elderly housebound, a presentation on our Zimbabwe project – all of this is part of the apprenticeship in the Christian way of life, deepening the awareness of Christ in the season of Advent. Yes, Christ in history, and Christ who will come again, but most importantly, the Christ who comes and is present is so many ways in our every-day C21 lives. The Liturgy Office for info on lectionary based catechesis and lectio divina. Shrewsbury (Paddy Rylands) and Brentwood (Nuala Gannon) produce weekly ‘lectio divina’ leaflets. We all know that our parish community is a warm and welcoming community – its just that sometimes we hide it quite well! I have three distinct experiences of moving to new areas and finding a new parish. When I left college and took my first job in a completely alien city, I found a warm, welcoming and vibrant parish community – people introduced themselves, told me what kind of things were happening in the parish and invited me to join in with certain groups and activities. When I moved to a new city with a new teaching post, I moved to a very active and lively parish – who didn’t need anyone else. They were quite happy with themselves, thankyou very much. After a couple of months, I gave up. I felt quite invisible. It was a frustrating and isolating experience and for a time, I didn’t go to Church at all until I moved house and thought I’d try again. It was a relief to find a parish where I met families I knew and children I taught. In my present parish (another city), there was a gradual initiation into the community in several stages. Week 1 – nothing. After a couple of weeks, when people began to realise that I was still there, there were a couple of nods of the head. After a month, there were greetings exchanged and finally conversation. Stepping into a new place, meeting a new community can be very intimidating. Parish communities are no longer as stable and established as they once were – people move for work and a whole variety of reasons. Perhaps in larger parishes, new faces are lost in the crowd. So how do we welcome new people into our communities? Our readings for the first Sunday of Advent asked us to ‘Stay Awake’. 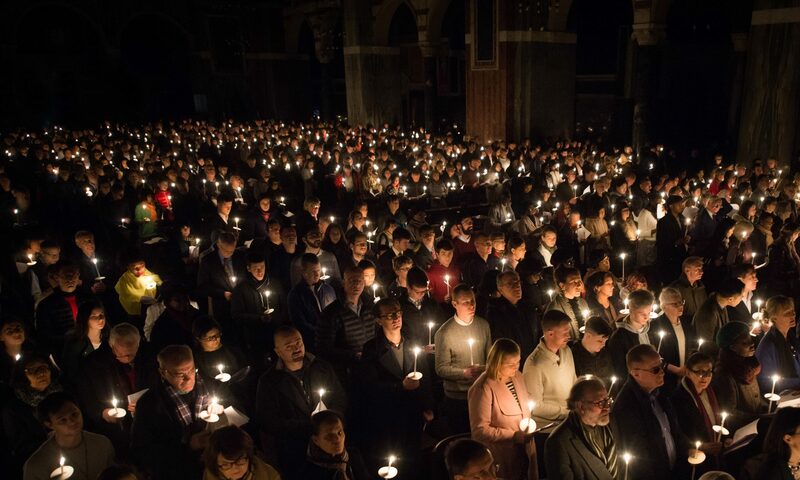 Maybe during Advent and the Christmas season, we can stay awake and watch for the new faces and families who join our communities and perhaps old ones we haven’t seen for a while. We may only meet them once or twice, and how we welcome them on those occasions makes an impression and might well make a difference. Take a special care to notice those who come to Mass on their own. How do we welcome those for whom English isn’t a first language? Do we have information in Polish, Portuguese etc? When you walk through the doors of the Church, what is your immediate impression? Is the word “Welcome” obvious? Is information regarding mass times, facilities and contact numbers (e.g. Children’s Liturgy leaders) immediately noticeable? Before Mass, who is there to welcome people? As the new Church year starts, clear out the clutter of old notices and papers and create a fresh and welcoming space. The First Sunday of Advent is one of the times, through the year, when many parishes celebrate the Rite of Acceptance into the Catechumenate. The continuing welcome we extend to those journeying towards initiation or reception into the Church makes a difference to their experience and the experience of the parish journeying with them. What opportunities are there for the two journeys to interact? Celebrate the liturgies of the RCIA publicly during the Sunday liturgy, pray for the Candidates and Catechumens during the General Intercessions, introduce the parish community to the candidates and catechumens and the candidates and catechumens to the parish community. Evidence suggests the welcome of the community both during the journey towards initiation and afterwards makes a difference to whether the newly received stay with the Church or disappear off the radar. There is information available on the internet. Visit Portsmouth diocesan website and for downloads on the Ministry of Welcome, Tips for Being a Welcoming Parish and Keeping in Touch. Also CASE Resources which has suggestions for welcoming people back to Church this Advent and Christmas.